In this photo taken from a chase plane, the Boeing ecoDemonstrator 757 flight test airplane —with NASA's Active Flow Control technology installed on the tail—makes a final approach to King County Boeing Field in Seattle, Washington. For the Active Flow Control Enhanced Vertical Tail Flight Experiment on board the ecoDemonstrator 757, 31 tiny devices called sweeping jet actuators were installed on the aircraft's vertical tail to see what – if any – effect they have on the aerodynamics of the tail and rudder surfaces. In the photo, white tufts pepper the side of the tail on which the actuators are installed; the tufts help researchers visualize the flow of air. The job of an airplane's vertical tail is to provide stability and directional control during takeoff and landing. The possible future benefit of the active flow control work is that the technology could take over some of the work provided now by the tail's size. "If we can control the flow of air over the vertical tail on demand, we believe we can provide enough side force during take-off and landing that aircraft manufacturers can safely make the tail smaller," said Mike Alexander, lead systems engineer for the flight tests at NASA's Langley Research Center in Hampton, Virginia. "The ability to reduce the size of the vertical tail would reduce weight and drag and decrease fuel consumption and emissions." 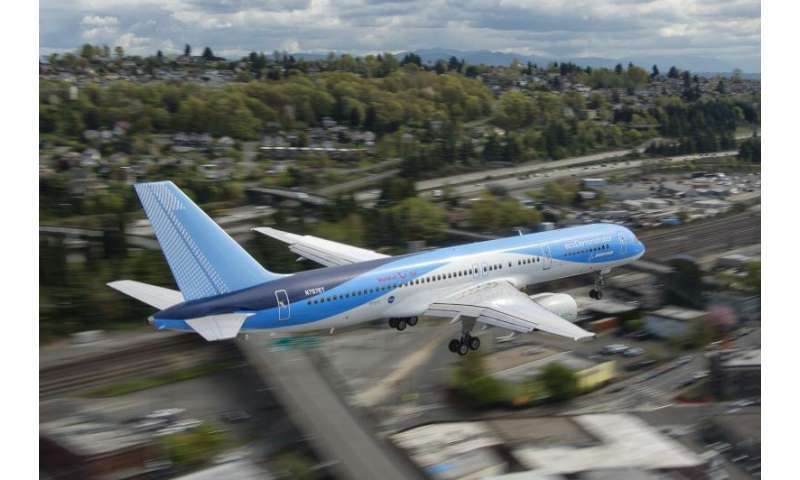 The ecoDemonstrator made six roundtrip flights April 9-15 between Boeing Field in Seattle and the Strait of Juan de Fuca. The active flow control technology was tested in a variety of configurations and flight conditions, including simulated engine failures. "Initial flight test results seem to validate the wind tunnel testing we did with a Boeing 757 tail that was outfitted with this same active flow control system. But we still have a lot more analysis to do," said John Lin, active flow control experiment principal investigator at Langley. Wind-tunnel tests of the same technology were performed late in 2013 at the National Full-Scale Aerodynamic Complex at NASA's Ames Research Center in Moffett Field, California. Results from these tests suggested future aircraft designers may be able to scale down the size of the vertical tail by about 17 percent and reduce fuel usage by as much as 0.5 percent, which quickly adds up to big savings. I'm convinced a textured surface on a plane can reduce air friction, probably tuned for a specific airspeed. Something like the surface of a bird which is textured because of the layered feathers. I'll bet no one has studied birds to see if their feathers have an affect on air friction. Unfortunately everyone else is convinced it won't work so we won't find out anytime soon.